Microsoft Edge for Android and iOS was announced last night, but there is a catch. In fact there is more than one catch. First, you should be a Windows 10 Insider, i.e., you need to be a member of the Insider Preview Program on the PC, to gain access to either the iOS or Android version of the browser. An employee from the Redmond company defended this requirement by saying that “Continue” on PC is a feature from the Fall Creators Update feature, which is currently only available for insiders. And this is part of the mobile browser’s features too. We don’t see why the company should restrict other users who don’t have Windows 10 or are part of the Insider program, who do not plan to use “Continue”, from using the mobile apps. Besides that, Android users will surely sideload the APK and get access to the app. iOS users though will be left out from such options. If you have Windows 10 on the PC, and you are part of the Insider Preview Program, visit this link from Microsoft Edge and select Android or iOS as per your requirement. The app supports Favorites, Reading List, New Tab Page and Reading View on both PCs and phone and you can switch to either the PC version or phone version, to view the pages where you left off, aka Continue mode. The app is not available for iPad or Android tablets yet, actually it has not been released yet for either OS. But Microsoft says that support for tablets will arrive in the future. 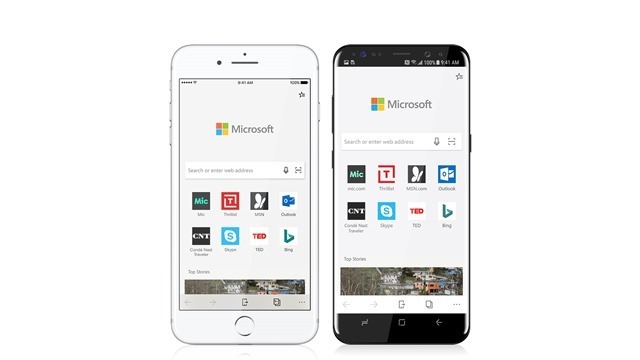 Now, Microsoft Edge for Android and iOS does not use the same EdgeHTML engine, instead it uses the Blink engine (same as the Chromium browser project) on Android, and WebKit engine (same as Safari) on iOS. You can refer to this article on Microsoft’s portal to know why, and also the announcement post for more information. Microsoft Edge for Android and iOS announced but there is a catch.